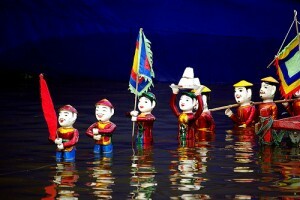 Vietnamese water puppetry has a long history. An inscription on a stone stele in Doi Pagoda, Duy Tien District, Nam Ha Province, relates a water puppet show staged in the year 1121 to mark a birthday of King Ly Nhan Tong in 4036 words. Puppets are made of wood and coated with waterproof paint. Each puppet is handmade, has its own posture and expresses a certain character. The most outstanding puppet is known as chu teu which has a round face and a humorous and optimistic smile. The show starts with chu teu, dressed in an odd costume, offering joyful laughter. The pond and lakes of the northern plains, where crowds gathered during festival and galas, become the lively stages for the water puppet shows. At a water puppet show, the audience watches boat races, buffalo fights, fox hunts and other rustic scenes amidst the beating of drums and gongs. The characters plough, plant rice seedlings, fish in a pond with a rod and line, scoop water with a bamboo basket hung from a tripod, etc. The show is interspersed with such items as a Dance by the Four Mythical Animals: Dragon, Unicorn, Tortoise, and Phoenix and Dance by the Eight Fairies, in which supernatural beings enjoy festivities alongside people of this world. In water puppet shows there is a very effective combination of visual effects provided by fire, water, and the movements of the marionettes. The whole control system of the show is under the surface of the water, concealed from the audience. When fairy figures appear to sing and dance, it is calm and serene; then the water is agitated by stormy waves in scenes of battle, with the participation of fire-spitting dragons. There are many contributing factors to the art of water puppetry, including such handicrafts as wood sculpture and lacquer work. The factors all work together to bring out charming glimpses of the Vietnamese psyche, as well as typical landscapes of Vietnam. Content Development by Eviva Tour Vietnam.